Throughout her career in radio drama, Elspeth Eric (born September 15, 1907) often played heavies – other or “older” women – or foolish gun molls. She didn’t fit the ingenue mold – having been born in Chicago to a doctor, and attending the upscale Bradford Academy*, then Wellesley College. For five years she juggled a number of jobs that had nothing to do with radio or show business – selling books, working as a clothing model, maid, social secretary, waitress – and so on. During the height of the Depression, she succeeded in summer stock theatre, then landed on Broadway in Dead End. Interestingly, though, her career in radio drama ended up lasting much longer than many of the ingenues she supported. 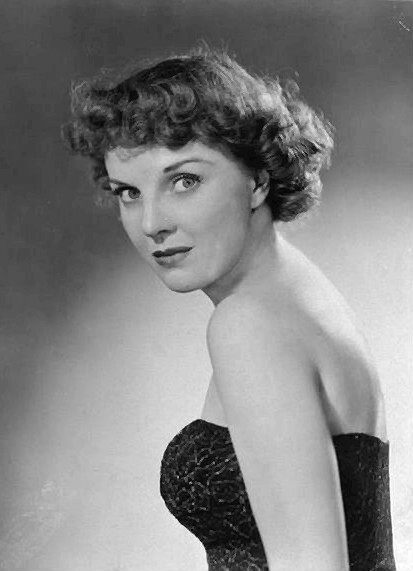 She may have appeared in another radio drama beforehand, but the earliest she has been credited, according to the RadioGoldindex, is on Orson Welles’ Campbell Playhouse (formerly known as the Mercury Theatre of the Air), appearing just a few months after the “War of the Worlds” scare, in Dashiell Hammett’s The Glass Key, on March 10, 1939. After her big breaks, she appeared on all kinds of programs for radio – soaps like Road of Life, Rosemary – but also procedurals like Mr. District Attorney, The FBI in Peace and War, mystery such as Murder at Midnight, Grand Central Station, and horror like Inner Sanctum. It was the last show that would prove helpful to her later career. Working for Himan Brown, Inner Sanctum’s producer, she later wrote over 100 episodes of Brown’s CBS Radio Mystery Theatre in the 1970s and 1980s, and appeared as an actor in another 13. While she also found success writing and acting in television, including a stint writing the acclaimed soap Another World, she famously declared that radio meant “less ulcers”, noting the extra difficulty that came with working in TV. She passed away in 1993. * Fun fact: Bradford Academy, now known as Bradford College, may have been the inspiration for Miskatonic University.